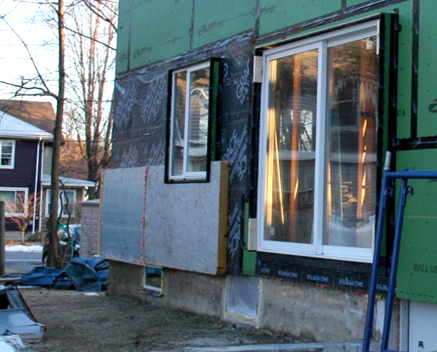 You can't expect to cut a home's energy use by 50% without a serious renovation of its exterior envelope. For all its components—walls, roof, foundation, slab—the details need to be worked out. Deep energy retrofit in progress. 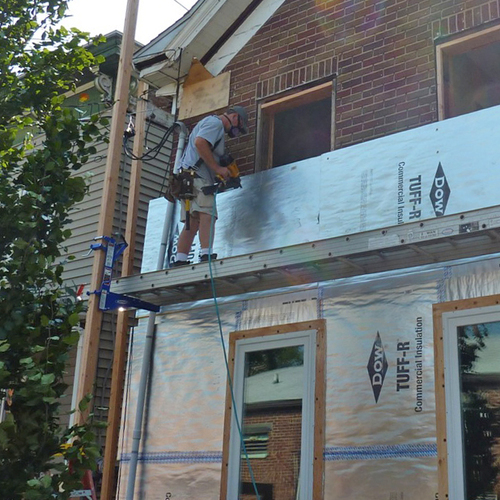 Foil-faced polyiso board is installed over new sheathing. 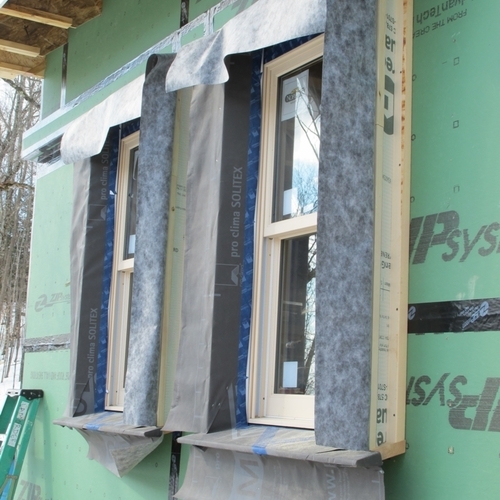 Triple-pane fiberglass windows are set in field-fabricated window bucks. 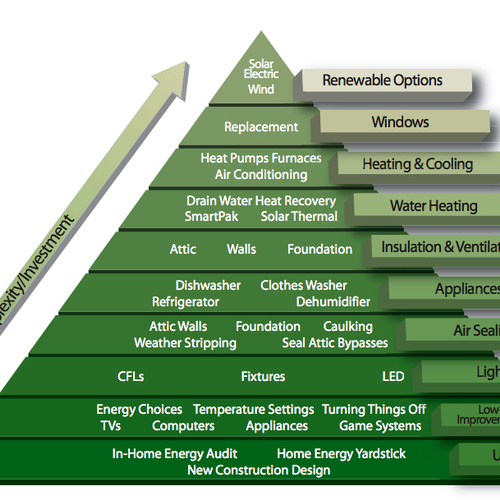 This is part two of the Green Architects’ Lounge three-part series on deep energy retrofits. In this episode, Phil and I discuss what we believe is the most crucial part of a DER: the exterior building envelope. There is no single solution. Here, we must be nimble and thoughtful, and deal with the structure that we’re given and apply the skills we’ve learned (and by we, I mean all of you listeners as well). To listen to GBA Radio on your iPod, right click on the green “Download .mp3” words above, save “Link” to your desktop, drag the file into iTunes, and enjoy the show whenever you want to! You can also subscribe directly from the GBA Radio on Itunes. Masonry veneers. We urge caution when dealing with such a moisture-sensitive material. Stick-frame construction: Walls. 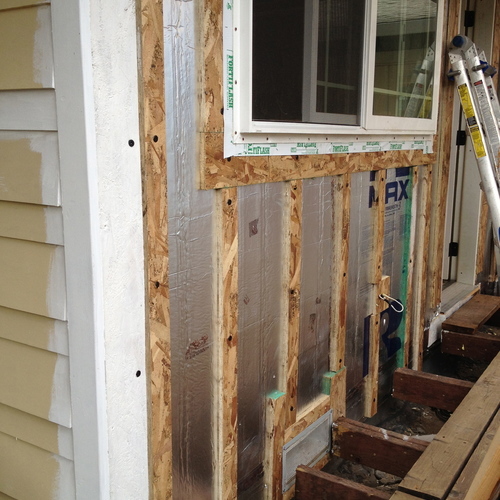 Do you add insulation to the exterior or the interior, and what does that look like? Moisture migration profile. You’d better understand how vapor is going to move through your envelope. Rafters and attic. Details matter. Phil shares a nice “lesson learned” story. Foundation walls. Should the insulation go on the inside or outside? It is here where Chris throws down the gauntlet (there will be arm wrestling). Slabs. What? They forgot to insulate your slab when they built your house? Phil and I feel your pain and talk about what might be done. Remember to come back in a week or so to find out who the better arm wrestler is. In case you find yourself in the curious and sometimes awkward position of listening to the Green Architects’ Lounge without a beverage in your hand, you might consider catching part one of this series, where we tell you how to make a sidecar. Enjoy the show. Phil Kaplan: All right, so you have different types of construction. You’ve got masonry, which is tough—it’s really tough. Chris Briley: Yeah! That is tough. P: Yeah, so we’re going to try to talk around that. We’ll reference it, because I think it’s important. P: Beautiful brick, and you just don’t want to mess with it. C: Right, right. And you can move the point at which frost forms within the outer wythe of bricks, so now you can start popping out the brick—you can damage the brick by moving that frost line into that assembly, so you want to consult an expert on the masonry. How about I leave it at that? P: I think that’s a good point, and I would also argue that for things that are large masonry buildings—or if they’re historic, for instance—if you have to renovate to the interior or add insulation to the interior, you may reach a point of diminishing returns. P: I don’t always want to say that because you really will still want to try to do the best you can with the existing building stock. But there are certain things that happen when you start adding insulation to the interior. For instance, if you’ve got a historic building, then you’ve got historic trim; that’s one. It’s a small building; your rooms get smaller—that’s two. You’ve got a stair to the exterior wall coming up from the basement and you’re trying to add 4 inches of rigid insulation—or 2 inches of whatever—to a stair that’s already 2 foot 8 wide, because it’s an old stair. Forget it. C: And if you’re doing windows…Dude, I did a—we were getting historic tax credits on a big masonry, old historic, registered historic building, and you know they wanted to keep the wood windows; refurbish the wood windows, put storms on them. That was a big can of worms—continues to be a can of worms because you know there’s one side that says, “Yeah, you’re gonna protect the windows by putting storms on.” They’d get like an R-2 or something like that. And then you get one camp that’s like “Yeah, we want that energy profile that’s more robust and substantial.” And then there’s the whole, well, do you get condensation on the storms and does that rot out the wood windows? I’m off on a tangent, aren’t I? P: No! It’s all complex stuff. I started to go off on another tangent where I saw this presentation of a project by Marc Rosenbaum, mechanical engineer, which we worked on. We actually put another window to the exterior of an existing window—at least to not muck up the interior of the existing historic structure. P: One right after the other, both double-hungs. C: Wow! Brilliant, I think, actually. Because you preserve the history. P: But it’s thinking. It’s hard work, all these puzzles. We should look at this as a challenge that excites us, and that’s something architects are probably always going to have to be involved in. Dare I say that? Not that builders can’t think; I do not mean that. It’s really going to be a team effort. P: But there’s big things involved here. C: So, let’s talk about stick-frame. P: Let’s talk about stick-frame, thank you. Because I think it’s safe to say there have been more stick-framed deep energy retrofits. C: Exactly. So where do you want to start—the foundation? P: No, I want to start with the walls. Let’s start with the walls—the easiest. OK, let’s add insulation to the exterior. What does that look like? C: Well, it’s probably polyiso, rigid foam board. And it’s probably the stuff that’s taken off really quickly, that Dow foil-faced stuff. And that’s great because it’s nice and rigid, and you got that R-7 per inch—so with 2 inches, you can add R-14 to your wall assembly. And if you seal it up, tape it up really well, then you get your remote system… What you’re doing is freshening up the outside of your house, and you’re not messing up your electrical, plumbing… Heaven forbid it’s in the exterior wall, but if it is, then you’re certainly helping the situation here. All your nice trim work and your finishes on the inside are being saved. Unless, of course, Phil, you’ve got the old poly vapor barrier in there, in which case you’re going to have a vapor sandwich. I think it’s probably time to start talking about—all right, when you do this, you’ve got to have that moisture migration profile, that moisture profile of your wall assembly. Draw that line upon which you are inhibiting the vapor from passing from one side to the other. If you find yourself drawing two—oops! You’ve got to make sure there’s a way for that to dry out. P: Right, that’s the biggest fear of what could go wrong, because you don’t really know what’s in those walls. You’d better do a hell of a lot of demo. I saw Peter Yost, with Green Building Advisor, a smart science guy from Vermont—he was practically pumping his fists, saying “Vapor profile! Say it with me folks!” at NESEA this year. Oh yeah—who doesn’t know what that is? This is exactly what you’re talking about, Chris. You’ve got to make sure this wall can still dry out. We can have complex wall sections now if we’re not careful. C: Exactly. And so the first thing you do is get out that hammer, get out that Sawzall; be brave. Find out—if you already know this wall’s going, or you’re doing that renovation, man, cut into it, look at it, find out what you’ve got. How bad is the situation? Do you have a sheet of plastic in there? Find out—do you have nothing in there? Oh, what a blessing, what a blessing. P: It’s better, isn’t it? P: I’m glad I’ve been suffering for the last five years I’ve been in this crummy house. C: Exactly—with no insulation. Because dude, now, instead of that foam, maybe you’re going to do a Larsen truss, maybe you’re going to do a double wall kind of thing; maybe it’s to the exterior, maybe it’s to the interior. I don’t know, but now you can do cellulose; you can pack that with what I consider the greenest insulation there is. That was a bold statement, but I’ll say it. P: I think you’re right on about the vapor profile. Look at it carefully; look at the perms for each piece of material that’s in there. Make sure you’ve got that drying potential. But, in terms of insulation to the exterior, let’s talk about some other ways to do it. We’re just figuring this out. There have not been thousands and thousands of deep energy retrofits. There are thousands of green buildings now; I believe LEED has gone out and labeled zillions of those things. Everybody can be LEED somehow, in some way. C: Yeah, that’s old hat. C: Oh, on the exterior? P: On the exterior; they’ve left shingles in place. Why not encapsulate them? Why do you have to take all the shingles off before you screw rigid insulation on top? C: Oh dude, you’re blowing my mind. P: What’s cheap and easy here? P: Yes sir, yes sir! You have to be careful! C: You’ve actually seen this? C: Oh wow, so they’re using foam as strapping? P: Foam as a spacer, and then 2x vertical strapping on top of that. They SIP-screw through the 2x, through the several inches of foam, through the shingles and sheathing, into the studs, hopefully. C: Into the studs, into the studs?! P: Yeah. So these things are just hanging on in a flimsy way to the outside of the structure. And you just go and fill that whole cavity with closed-cell foam. P: Build yourself a nice little Thermos, which is what we’re trying to do anyway. You encapsulate those little shingles; they don’t go anywhere, to any sort of landfill. C: I don’t know man. That just makes me—I feel funny about that. C: Maybe it is the drink! Well, that’s a good point. I said 2 inches of rigid foam, but really, why stop there? C: Go to 4. Because we’ve got these awesome SIP screws like you just mentioned. They’re kind of revolutionizing how far you can strap this stuff. And the polyiso as a rigid foam is very rigid; it’s hard to compress it to a point where it’s problematic. So you can get 4 inches out there. Move your exterior out that far and you can tape it up, seal it up real nice. Nicely. C: Up here in Maine, it’s a trend to drop the adverb. The ly-s. You drive safe—ly. All the Mainers are like, yeah yeah we know. C: That was wicked good, you like that? Ayuh. C: OK, you want to talk more about the exterior of the wall? P: No, I want to talk a little bit about the windows. P: Because really, that’s… You look at it, you see a wall section, and you go, “All right, I can throw 4 inches of foam on this thing. I can handle that.” That’s not the tricky part. How do you make a window buck that extends 4 inches to handle this rigid foam? Because, really, that’s the tricky thing. You’re sticking these windows—especially because you have your inny window vs. your outy window—you’ve got to create window bucks that actually have solid framing that you can stick to the window, to the exterior of your 4-inch window block, so it’s essentially flush with the rigid insulation coming into it on all sides. C: You’ve got to seal that up. P: You’ve got to seal it really well. It’s a funny-looking thing that you’ve just created. And what does it look like? Is it 2x that’s sticking out on all sides? Is it ¾-inch plywood with some sort of nailer that’s a 2x nailer that’s a stiffener, so you have some way to nail the trim on the side? Or hold the window flange down. C: Yeah, and we’re inventing this stuff in the field. Or you and I are coming up with details, just like all these other architects. P: Yeah, I see 10 different ways to handle this. P: I have a dream, Chris! C: Yeah, taking it to the state. C: I mean, sometimes the roof and rafters are easier, because sometimes we’re re-roofing—a lot of times we’re re-roofing—and so a lot of times we have the ability to add to the exterior of the sheathing. You can add a whole SIP panel assembly. P: 2x4s at 36 inches on center. P: R-60, R-80, R-all of it. C: R-100. And I’m assuming rafters in all these scenarios. P: Yeah, we’re talking about stick-frame. P: Whichever, really. But the interesting thing that you bring up about the roof, because there are several ways of doing this, if you can add the cellulose inside it—it’s fine, it’s great. But most times, I think you’ll be adding stuff on top. You said SIPs, or rigid insulation, or a combination of rigid and cellulose; something still funny is going to happen to that roof, because you’re adding a chunk to that wall. You’re bumping out that wall 4 inches, and suddenly your roof edge, that eave, is going to look really dumb. P: This is interesting. I want to share this with you, Chris, because we just learned this and looked into it in detail. C: Oh, I love stories like this. Is this a lesson learned story? P: Before it was too late. C: Great! Hit me. I’m sitting back. P: We had the idea on this roof: why put SIPs; why can’t we put nail base? Nail base is essentially a one-sided SIP—a chunk of rigid insulation with sheathing on one side. Because you’re nailing it on top of a roof, which has sheathing already. So, why not? Let’s just do that, and save some time and money. Not if you want overhangs. Nail base is not meant to cantilever. It’s not structural the same way as structural insulated panels. Nail base doesn’t get to use the R—um, doesn’t get to use the S. It doesn’t get to use the structural part, because it’s just not. C: It’s just the I. C: Because you don’t want to strap it. Because if you do that you get little air channels that end at your SIPs. P: Then you’re in trouble. Don’t bother with nail base. It sounds like a good idea… If anyone knows a better idea, a way to use it, I’d love to hear it. But we couldn’t figure it out, with real overhangs. C: You couldn’t figure it out? P: I couldn’t. My kids just might be able to. C: Yeah, give them some time. C: You’re probably doing everything to the interior. Not necessarily. Because this is one of those times to investigate. This is one of those “it depends on what you have” scenarios. Right? P: I would argue that I don’t think it would be most of the time that you would do the interior. C: Oh really? Are we going to argue? P: We’ll have a conversation! Why, I oughta…! P: Are we really taking a break? P: You look a little weak to me. C: OK—what were we talking about? P: We were talking about the foundation. OK, so, foundation insulation. Here’s the thing that’s going on. You can do the inside. What was it, a rubble wall? Who knows what it is. You’ll probably just spray-foam if it’s something funky on the inside. But you still have to deal with mechanicals and pipes and all that junk that’s on the inside of your basement wall. If you did the outside, then you’ve got to dig. But, the thing that might be a good idea—you’re adding 4 inches of rigid insulation to the exterior of this thing anyway. You’ve got this funny shelf that sticks way out; so why not just keep it flush all the way to the ground, close to it? C: Well, that’d be great. I would say that makes sense. If you’re going to take care of some moisture problems, if you’re going to do some de-watering of your site, if you’re going to—I don’t know. There are some nasty basements out there that really the best way to take care of it is to just say, I’m doing it—I’m going to excavate around this sucker. I’m going to take care of some structural problems, I’m going to take care of some leaking problems—and while you’re at it, before that backfill goes in, why not take a look at some Roxul, which I like for the exterior. C: Exactly. So you throw a few layers of that in, and then you’ve got your insulation on the outside. But, if you walk down to that basement, and it’s not really a leaky basement, it’s a good poured concrete basement; it might have that dank smell to it, but there’s no active moisture. I think that’s a good candidate to tackle this from the inside, as opposed to doing stuff to the outside. P: I’m with you. But what about the slab? C: Through the ground! No. So, headroom. Is it an issue? If you don’t, then, hey, let’s go ahead and put in some rigid down there and pour another slab. P: Yeah, absolutely. Then you have the opportunity to make yourself a really dry, comfortable, livable basement. Think about the space that you’ve just gained and can feel good about. It’s not going to stink and leak, no mold. That’s a huge value to your house. C: Another thing you can do: a SIP floor. You could put sleepers down, or dimple tile, with concrete and shallow SIPs, and use it as a floor. P: That’s cool. You were telling me about the product that you used to do that. P: You’re feeling out-gassy today? Voiceover: So that’s it for this part of the episode. Tune in for more from the Green Architects’ Lounge podcast. A quick reminder, our music is Zelda’s Theme by Perez Prado. And our views and our drinking habits do not necessarily reflect those of Green Building Advisor. Thanks for tuning in everyone, and keep up the good work. Thanks Chris and Phil. Yeah, you guys are international alright. Listening from Ireland. You do raise a lot of very useful points with regard to deep retrofitting. I was very interested to listen to your views about stick framed versus masonry construction and retrofitting. The structures here in Ireland are very often masonry, and stick framing only arrived for new builds from the 1990s onwards. Many of the early stick frames here, claimed this 'super warm' label when they came in first. Although there was nothing particularly fantastic about their construction. There was a huge spat here, at the height of the building boom in Ireland, between the timber faction and the masonry. Each competing for what was then considered to be a very lucrative pie. Joseph Little's Part 3, Breaking the Mould series of articles available from his webpage, looks at some of the key issues he stumbled across in studying envelope retrofits. Joseph Little dot com, slash papers. One of the things that was discovered during an Irish fact finding mission to Canada, to observe how the Canadians had administered their energy conservation schemes over decades, was the need to create a good skills base and contractor accreditation system for energy retrofits. The spam filter is not allowing me to post links at the moment. Not to worry. If you go into the 'blogs' section at Construct Ireland dot ie, and click into the tags sections, there is a tag called 'retrofit' with some good blog entries. I don't know if you are familiar with the DOE's ESPC contracts in the US. I was thinking about it today, and this point about having contractors which are certified to do work on energy retrofits. The 'construction industry federation' is the agency in Ireland tasked with the job of keeping many of these registers for contractors, for health and safety, and energy awareness/skills nowadays. It occured to me, when you think about it, the DOE in the US were quite clever. They created a register of companies who could operate as ESCO's in the ESPC procurement method, so as the fast forward the projects. I.e. If the contractor doesn't have membership of the DOE's register, it takes much longer and more admin work to set oneself up as an ESCO, and get the project moving. Anyhow, that is probably on quite a different scale to what you are dealing with. But there was at least some rumblings over here in Ireland, that if you could get enough home owners to band together and do their retrofits consecutively, they could obtain some kind of contract with an ESCO, whereby they could finance their retrofits. I'll believe it when I see it, but one hopes at least. Stay tuned Brian. An upcoming podcast will be about PACE (Property Assessed Clean Energy) financing. Here in Maine (and other parts of the US) there's some exciting developments in incentivising renewables and deep energy retrofits through state loans (by way of municipal bonds). One of the tricky parts is certifying the the work that is ABOUT to be performed. One way is to set up qualifications for builders who want to work within this financing program. This will be in addition to third party certification of the installation by an energy auditor. Lots of head scratching stuff. Our drinks will not be as strong for that episode. What I liked about the ESPC method, was that the ESCO could end up paying back money to the federal government, if the required savings in energy were not met. That put a lot of pressure on the ESCO to stay on program in terms of the building roll out. The big trouble with traditional procurement, is the project is completed and everyone walks away from it. Some helpless building landlord or management company is left behind, with what should be a comprehensive safety manual for all of the systems and structure. That has always been a huge grey area where construction is concerned, the after sales service. I got a kick from hearing in the podcast, about situations in Maine, where you find a framed structure which doesn't quite come up to code. It gets too tricky to deal with and you have to direct your client to a structural specialist, as fast as possible. I mean, you do find yourself in those situations wondering, how does it even stand up? Many of the old Georgian red brick masonry building stock in Dublin for instance is a grey area for structural engineering. The buildings have been occupied for centuries, yet if you were to analyse them with today's wind load structural analysis, they should all fall down. Because there is such poor tying between the exterior facades and the party walls. It is difficult often to do anything with older building stock - either from a structural point of view, or an energy retrofit point of view. Very few structural engineers will even take on the risk of doing retrofits for them. I posted them together in this Q&A item, for your interest. Could you guys post some images of deep energy roof details done well and poorly? That's a great idea for a separate blog! (I've actually heard it more than once) Phil and I both LOVE "what's wrong with this detail" conversations, and while a podcast is not necessarily the best format for graphic and photographic it might be good to just have an episode of stories of failure and problem solving. We will put that in the que. For details that work, this website has a lot that's even downloadable in a CAD format. Old house with no sill gasket - will my walls be able to dry? I don't think I can complete my deep energy retrofit if I don't add foam board insulation on the exterior of my walls. I'm prepared to do this, but I'm worried about moisture accumulation inside the walls. My foundation is a clay tile. It's old but in pretty good shape. There's no sill plate and nothing between the rim joist and the foundation in this construction. I'm worried that moisture from the ground will wick up through the clay tile foundation and migrate into the wall via capillarity. Is this a valid concern? Should I not add exterior foam insulation if there's risk of moisture coming up through the foundation? I know buildings that have a sill gasket don't have as much risk for this. It isn't as hard as you think to jack up a house just 1/2 inch -- enough to slip in a capillary break between the top of the foundation wall and the rim joist. You can use EPDM roofing or a similar rubberized membrane in this location. To read about how it's done, check out this article: Rubble Foundations.